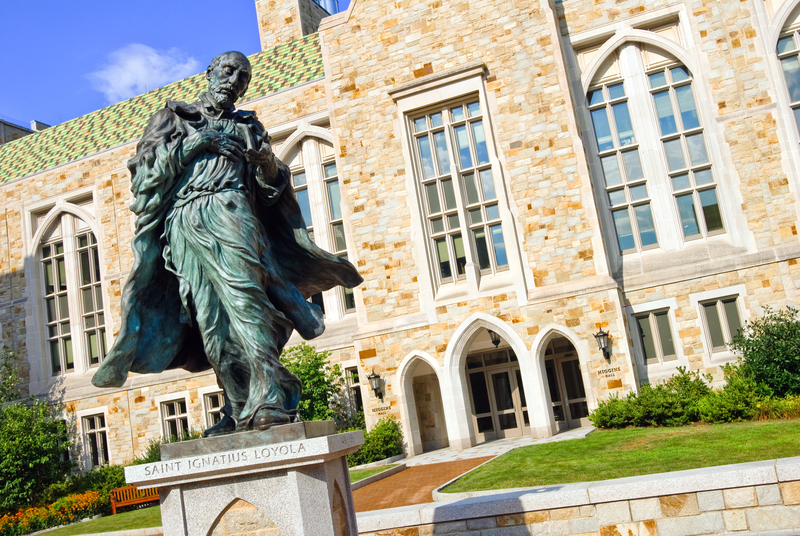 Saint Ignatius Loyola statue in front of Higgins Hall at Boston College. Six Jesuit schools broke into the top 100 “Best National Universities” in this year’s rankings from U.S. News and World Report. Two Jesuit universities tied for a single spot. Sister Jean’s star power led Loyola University Chicago to jump 21 spots in the rankings to number 89—a place they share with their Midwestern neighbor, Marquette. Meanwhile, Georgetown came in at 22, Boston College at 38, Fordham at 70 and the University of San Francisco creeped in at 96. Across the nation Jesuit Universities topped their regional rankings. Creighton, Fairfield and Santa Clara all earned the top spot in their respective geographic regions. For “Regional Masters Universities,” Jesuit schools were represented best in the West, with Santa Clara (1), Loyola Marymount (3), Gonzaga (4) and Seattle (8), taking four of the top 10 spots. In the Midwest, Creighton (1), John Carroll (4) and Xavier (8) worked their way into the top 10. The Jesuits performed similarly well in the North, where Fairfield (1), Loyola Maryland (5) and Scranton (6) ranked highly. Fourteen Jesuit universities were recognized as being in the top 25 “Best Value Schools” for their given regions. Canisius (North, 10), Gonzaga (West, 6), John Carroll (Midwest, 8) and Le Moyne (North, 5) performed best. Many schools were recognized for “Best Undergraduate Teaching Programs”—colleges with a strong commitment to teaching undergraduates, as opposed to research. Creighton, Fairfield, Gonzaga, Scranton and Xavier all placed in the top five of their respective regions. Jesuit schools also performed strongly on the list for “Best Colleges for Veterans.” Creighton came in number one in the Midwest, and Georgetown, John Carroll, Loyola Marymount, Saint Joseph’s and Santa Clara ranked among the top five in their respective regions. My thoughts exactly. Since when do we use the worlds benchmarks to judge the church? My wife went to LeMoyne in Syracuse for two years. The other two state schools she attended were more Catholic than that place (at least they were not anti Catholic). How would you or I know if they practice their faith? It is not for us to judge. How is it that you left of College of the Holy Cross? It’s # 35 on the Liberal Arts College list and consistantly one of the top Catholic (and Jesuit) colleges. I didn't attend a Jesuit college, but I suspect that many Catholic colleges have a number of students and graduates who, having been taught by professors who dissent from Church teaching, also dissent from Church teaching and and poorly practice our faith. I graduated from Cabrini College in 1989 with a degree in Education, and became a Special Education teacher. The college was sponsored by the Missionary Sisters of the Sacred Heart. Although I certainly don't claim that I practice the teachings of Jesus as interpreted by the Church without error(s), I do receive forgiveness and consolation through the Sacrament of Reconciliation each month. More than a few professors believed in the morality of contraception. One of my theology professors made it clear that she didn't believe in the Virgin Birth, and believed in the morality of abortion in many circumstances. (Ironically, I did very well in her course). Probably the most serious matter was when the college newspaper ran an advertisement for a gynecologist who was well-known in the county for performing abortions. In fairness, the ad didn't state that he performed abortions, but merely had his contact information for gynecological services. When a former newspaper editor informed the newspaper staff that the gynecologist performed abortions, she was ignored. Then, two students and myself who were active in Campus Ministry made out objections to the ad known to the newspaper editor, but the newspaper chose to continue to run the advertisement based on a misguided idea of freedom of speech. When my two friends and me met with the college Vice-president concerning our objections (he was a former seminarian) it was difficult for us to persuade him that it was improper to run the advertisement. (As noted, the newspaper ran the ad for a time in any event). In my experience in different classes, it was clear that the great majority of students believed it was acceptable to publish the ad, and many expressed support for the violence of legal abortion. How unfortunate and sad. I will say that I received a generally good education in "secular" courses, but my education in the theology courses was rife with dissent from Church teaching. I've never contributed financially to my alma mater (which saddens me in a way) but occasionally contribute to Christendom College and Franciscan University of Steubenville. Regardless I had dial up until like secondary school. We were required to have PCs and I continuedn and Do My Homework by Homeworkclock.com disclosing to them we couldnt manage the cost of the 90 bucks to have them. However, if I wanted my child to receive a solid Catholic (not Jesuit) education, I wouldn't choose any of these colleges. Come on, Mike, Notre Dame is C.S.C, a French missionary order, not Jesuit. True Catholics have a very sour outlook on higher education/ How could they not? Higher education, whether at a secular university or a Catholic university, leads to either dissent from within the Catholic church or to total defection. What a bunch of grouches! You remind me of thistles:Not much to look at and even less to touch. They encourage independent thinking and accepting responsibility for personal actions. There is nothing un-Catholic about that. True, graduates are not sheep. They are Ignatian goats. You know what I like about goats? They eat thistles. Also, they think for themselves. *West Point if it matters. Ciaran Freeman is a Joseph A. O’Hare Fellow at America.